Thank you for your support of the Bulletin. We are at a world-saving moment and each of us has a role to fulfill – as citizen, advocate, artist, journalist, scientist, and policymaker. Our award-winning journal, iconic Doomsday Clock, open-access website, and timely events promote evidence-based policy debates essential to healthy democracies and a safe and livable planet. The Annual Fund for the Bulletin is a yearly comprehensive fundraising effort which raises necessary funds in support of the online magazine and the organization’s yearly operations. We are grateful for the growing number of individuals who are committed to our mission. Thank you for endorsing the Bulletin as your trusted source for evidence-based journalism about issues that matter. There are many ways in which you can contribute to the Annual Fund. For more information, explore the different Ways to Give or contact our development office at [email protected] or call 773.834.4077. 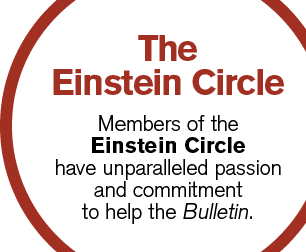 Consider joining the Einstein Circle! Circle members make annual leadership gifts of $1,000 or more to the Bulletin and experience access to special briefings, exclusive invitations, personalized communications and much more. The Bulletin of the Atomic Scientists is a US-based, independent, 501(c)(3) non-profit organization, Federal EIN 36-2136497. Gifts made in the US are tax deductible to the fullest extent allowed by the law. Read the Bulletin and stay informed about the world and the incredible pace of scientific and technological change. Write letters-to-the-editor for your local newspaper, outlining policies you would like to see in place both locally and on a national scale. Engage with your elected officials to let them know you expect them to support evidence-based solutions to the existential issues of our time.